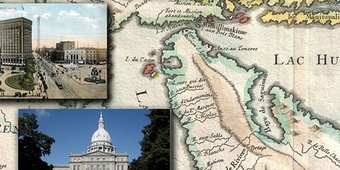 The 3rd Grade Michigan Studies book consists of four major units with sections within each focused on the four main disciplines and public policy. Michigan Studies, Chapter 1: What Makes Michigan Special? What do you think makes Michigan special? You might be thinking that Michigan is special because it is your home. Maybe it is special because the people you care about live in Michigan. These are wonderful reasons. This resource will help you learn about many other ways that Michigan is special. Michigan Studies, Chapter 2: What Factors Most Significantly Impact Michigan’s Economy? In the first chapter you learned about geography, one of the important areas of social studies. You explored the geography of Michigan and its many special natural characteristics. What do people do with the natural characteristics of Michigan? They put them to use! They plant crops in the soil. They use wood from trees to build houses. What do they do with water??? Lots and lots of things! There is a special name for things in nature that people find useful: natural resources. In this section you will learn how natural resources are important in another area of social studies: economics. Michigan Studies, Chapter 3: What Does Michigan's Government Do? You have learned that there are different areas of social studies. You have learned about geography. You have also learned about economics. In this chapter you will learn about civics. You will discover that civics is the study of government. It is also the study of the role people play in government. But, wait! What is government? Michigan Studies, Chapter 4: How did the Movement of People Impact the Early History of Michigan? You have learned that there are different areas of social studies. You have learned about geography. You have also learned about economics. In this chapter you will learn about history. You will discover that history is what happened in the past.